Hey Remodelaholics! Kristin from The Hunted Interior. I am a sucker for Chalkboard Paint & so is my two year old. She LOVES drawing on our giant chalkboard wall in our kitchen. When I was trying to find some baskets to help organize her growing toy collection I put two of my favorite items together to create a nice toy box storage option. Wine Crates are such a great (& usually free) item to utilize. We have a stash of them out in the shed ready for all of my crazy ideas. Not wanting to display our favorite wineries in our daughter’s room, I applied a coat of leftover Rustoleum’s Chalk Paint & voila! One of the easiest projects I have ever completed. These crates are readily available at your local liquor stores. Just simply ask them if they have any extras they are throwing away. These would look great anywhere you need some extra storage. A mudroom, kitchen, laundry room, closet… the possibilities are endless. If you’d like to see more of the tutorials over at The Hunted Interior, click here. Wasn’t that a great idea for a toy box storage? Super cute idea! 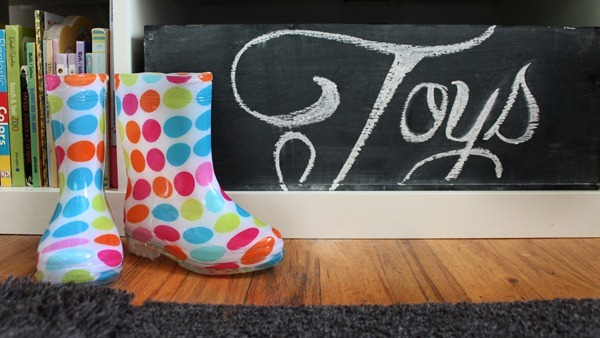 It’s a great way to incorporate chalkboard paint without a huge commitment. It also doesn’t hurt that you have some serious handwriting skills. Wow – LOVE them! Very cute and stylish! Wondering where the storage cube is from? I’ve been looking for one and I love how you’ve filled each space! Hi Susanne! This is a guest post from another blogger, but I believe that the crates are originally wine crates. Love this! Where is the bookshelf from? Thanks, Meredith! I’m not sure where the shelf is from — you’ll have to click over and ask The Hunted Interior.